As experienced ABYA Yacht Brokers we know buying a brokerage yacht can sometimes be more complicated than purchasing a house. However unlike a property purchase, we as professionals will handle every aspect of the sale including the complicated legal requirements until completion. We are the ‘solicitor/lawyer’ and look after all the conveyancing to ensure the process runs smoothly for both parties. All our brokers are Full Members of ABYA , are qualified and as a requirement of membership must carry professional Indemnity Insurance, hold client accounts and follow the ABYA code of practice. Your sale or purchase is controlled using an official legal ‘Sale & Purchase Contract.’ This will cover the vital financial and legal transactions, contracts and transfer of legal title. We will ensure the distribution of proceeds, settlement of yard/marina fees or any outstanding bills are paid, that the boat’s title documents, mortgages (if British Part 1 Registered) VAT and RCD status have been checked prior to completion. 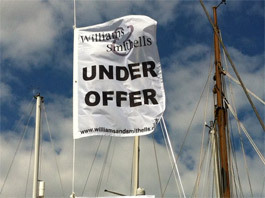 Below is our shortened guide to the normal process of buying a yacht locally or internationally. Our guide should give you a much clearer picture of the various stages and what happens and is expected at each. All W&S brokers are full ABYA members.